Summary: Abbie Wu is about to start middle school, and she is not excited about it. To her, the middle is not a happy place, having spent her life stuck between an adorable younger sister and an overachieving older brother. Not only that, but she is supposed to choose an elective, and she doesn’t know what her “thing” is. Her best friends both have a “thing”—Maxine loves the theater and James is a genius at games. Since Abbie can’t make up her mind about an elective, she gets stuck in study hall. And in study hall, her stomach rumbles embarrassingly; school lunch is such a disaster that she’s starving by the afternoon. Turns out she’s not the only one, and pretty soon she’s organized a snack exchange, first in study hall, then in the whole school. It’s such a hit that Abbie thinks she has a “thing”…until the principal discovers what’s going on and shuts her down. Fortunately, Abbie has a supportive, if somewhat eccentric, family, and they help her discover that it’s okay to fail occasionally, and she might just have a “thing” after all. 240 pages; grades 3-7. 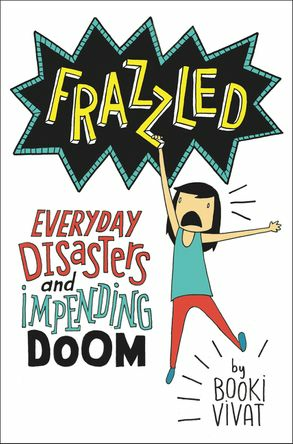 Pros: Reluctant readers will embrace Abbie, with her humorous observations on middle school and her book full of funny cartoon drawings. A sure “thing” for Wimpy Kid and Dork Diary fans. Cons; While it’s still wildly popular, the whole irreverent middle school diary illustrated with cartoons “thing” is getting a bit old in this reviewer’s opinion.